After the IFVs acquisition project the other important one is the purchase of 12 helicopters to replace the ageing Russian Mi-24 models. The project is running since 2015. Twelve multipurpose helicopters would represent the 1st phase. In total the Air Force would acquire 30 to 35 rotorcrafts to replace the currently operated Mi-24, Mi-8 and Mi-17 helicopters. In February former Minister of Defence Karla Šlechtová suspended the project, stating that the Czech Army has out a series of requirements which no helicopter currently on the market could match. In June the Chief of General Staff Aleš Opata presented the actual aims and priorities of development and modernization of the Czech Army, including requirements for the multipurpose helicopters. Currently the Czech Air Force operates 52 helicopters. These are: 17 Mi-35/24Ws and 4 Mi-171Sh's by the 221st Helicopter Squadron and 11 Mi-171Sh's by the 222nd Helicopter Squadron at the 22nd Helicopter Air Base in Náměšť nad Oslavou, and 3 Mi-8s, 5 Mi-17s and 10 W-3As by the 243rd Helicopter Squadron at the 24th Transport Air Base in Prague-Kbely. Plus two Mi-2s, which see their last year of service in Pardubice Flight Training Center. The Mi-24W (NATO reporting name „Hind-E“, original Russian designation Mi-24V) is a later development of the Mi-24 attack helicopter and entered production in 1976, Mi-35 is its export designation. It is a two-engine attack helicopter designed for close air support of ground forces against armoured targets, and for transport of personnel. 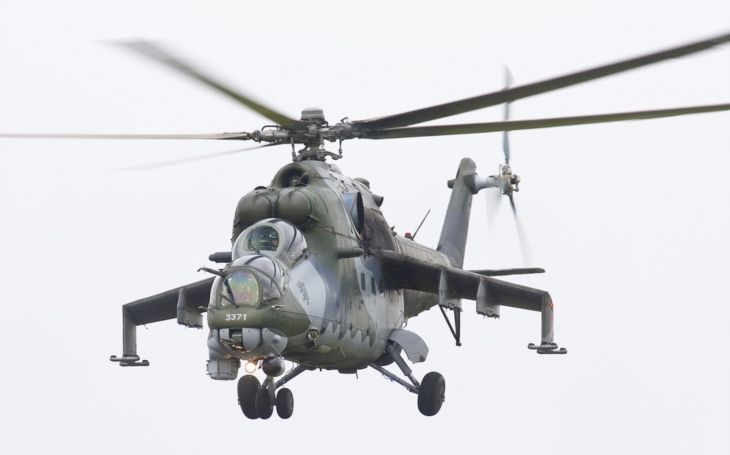 The Mi-171Sh („Hip-H“ for the Mi-17) is export version of the Mi-171AMTSh variant, which is an armed assault-transport version of the Mi-8AMT and can carry the same range of weapons as the Mi-24. The Mi-8 („Hip“) is a medium multipurpose two-engine helicopter of classic Russian design, and it is one of the most extensively used helicopters all over the world. The W-3A Sokol is another two-engine multipurpose helicopter based on the Mi-2 („Hoplite“). The Czech Air Force operates these since mid-90’s when they were exchanged with Poland for the Czech Mig-29 fighter jets. The Czech helicopters were modified to serve with the emergency medical services. The 12 light multi-role helicopters were initially to be delivered at the end of 2017, or at the beginning of 2018. Czech Republic submitted requests to the USA, France and Italy where the largest helicopter manufacturers are based, including Bell Helicopters, Sikorsky, Airbus Helicopters and AgustaWestland. The contract was supposed to be worth CZK 6–12 billion (USD 270–540 million in actual rates). Several helicopters were proposed and considered. They were the Airbus H145M, Sikorski UH-60 Black Hawk, Bell UH-1 „Huey“ and the AgustaWestland AW139M. Purchase of multipurpose helicopters (replacement for the Mi-35/24V) including armaments and ammunition will allow the Air Force to progressively develop its capabilities in the domain of combat support of the ground and special forces in the territory of the Czech Republic and during foreign deployments, and in the domain of air protection of the Czech Republic. Cooperation with the Integrated Rescue System. Service ceiling at least 4,000 m.
Active and passive protection system. After the new Minister of Defence, Lubomír Metnar, was introduced to the office on 28th June, the Prime Minister Babiš said: „We must make sure that the ministry makes purchases in a transparent way and that there are no influences by lobbyist groups.“ Minister Metnar sees the completion of the key defence contracts and the purchase transparency as crucial.